How will climate change affect plantation forestry in New Zealand? The forests of Lake Taupō and Lake Rotoaira are unique. Having started as joint ventures with government, the second rotation stands, which are now approaching maturity, are all Maori-owned and governed by the Lake Taupō and Lake Rotoaira Forest Trusts (the trusts). The forests are intensely managed with innovative, science-based techniques designed to produce high-value trees. 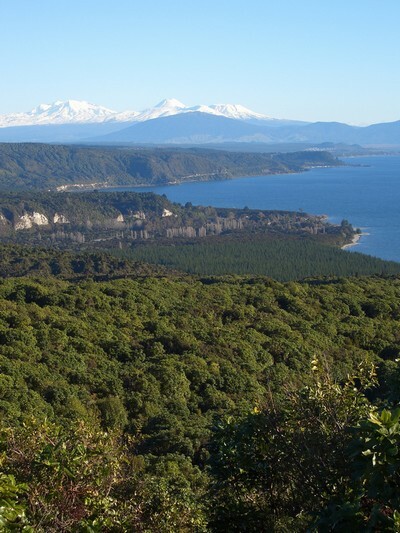 Lake Taupō Forest Management oversees the management of these forests on behalf of the trusts and they want to ensure the high-value crop comes to fruition, while growing capability within their ranks. Partnering with Scion, Lake Taupō Forest Management has just completed a two-year study supported by MBIE’s Te Pūnaha Hihiko Vision Mātauranga Capability Fund, which saw iwi researcher Ben Aves join Scion on secondment. Working together with Jonathan Dash of Scion’s Forest Informatics team, the duo designed an experiment across two forests comparing improved trees with unimproved trees using a new laser scanning dataset recently acquired by the trusts. One of the key investments the trusts have made is in planting genetically improved, clonally propagated trees. Over the past 10 years, wherever they planted a new section of clonally propagated trees, they also planted a block of non-clonally propagated trees nearby in very similar growing conditions. This created a valuable comparison for Ben’s experiment, which was aided by a recently acquired LiDAR dataset for the two forests. The LiDAR dataset provided Ben with the information needed to optimise the sampling design for the experiment. This reduced the total number of sites that needed to be measured in the field, and increased the efficiency of estimates of growth performance across the forests. He was able to identify pairs of both clonal and non-clonal plantings of the same or similar age and not less than three years of age. Each pair was within 200 m of each other, and had similar soil, elevation and climate. This resulted in 144 plots (72 clonal, 72 non-clonal) for Ben to measure for tree growth metrics, straightness and other wood properties. Examining the data collected on the ground, and linking it to the LiDAR data, showed Ben where patterns could be established. Ground measurements were linked to metrics calculated from the LiDAR point cloud. Using these relationships between the ground data and the LiDAR point cloud, models were developed to upscale information from Ben’s field measurements to the entire experiment. Separate models were created for the clonal and non-clonal trees, each including variables that affect value recovery – tree size, uniformity and branching patterns. Site information including slope, aspect and elevation was extracted from the LiDAR data and accounted for in the analysis. The results of the experiment were very promising. The three key findings showed that for a given age, the clonally propagated seedlings were larger, straighter and grew more uniformly than the non-clonal seedlings. These findings indicate that the trusts’ investment in science and precision management was worthwhile. The two trusts administer around 50,000 ha of land, with approximately 16,000 Māori landowners, and many more whānau who have a connection to the land. The last of the joint venture stands in Lake Taupō Forest will be harvested in 2021, after which the trust will commence harvesting its fully-owned stands. The same will happen in Lake Rotoaira Forest from 2026. Ownership and management of the second rotation crop has required that the trusts assume responsibility for all management decisions, so capability building projects like this are multipurpose. Scion and the Lake Taupō and Lake Rotoaira Forest Trusts are looking forward to developing a new project together.